The Solution Library is a directory of solutions to help create a more sustainable world. 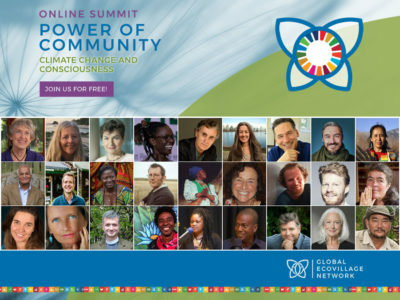 What is happening in the world of ecovillages, and for GEN and it’s Regions? Gatherings, Conferences, Festivals and other Events focused on community, solidarity, and sustainability. Learn how to build a regenerative culture with books, films, magazines, games, teaching tools, and more. An online tool for mapping ecovillage practices to showcase low-carbon living models. Communities around the world are taking action to respond to the challenges of climate change.